Currently I'm building the first parts of my truck's furniture system. 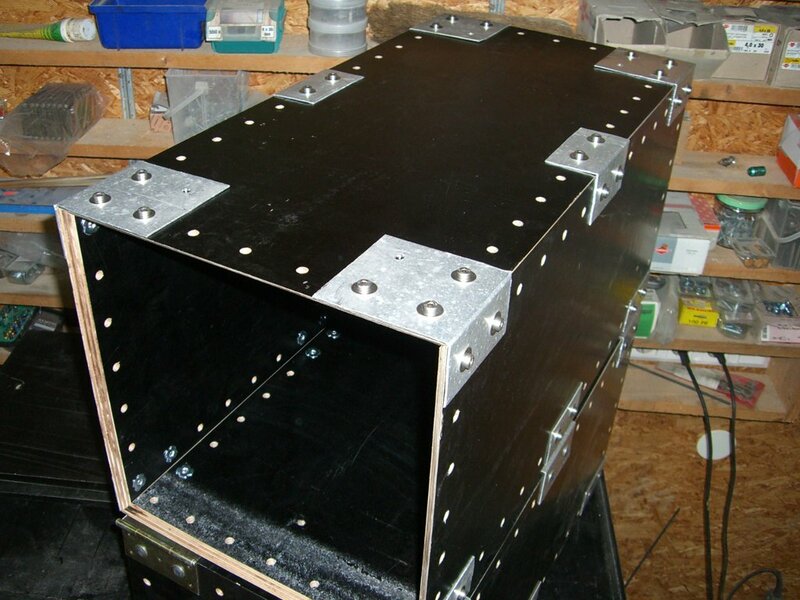 The system is based on gridbeam, an awesome simple DIY construction system from the 1970's. Practically this means: boxes, room partitioning walls, shelves, desks etc. all use the same sheet material and connector elements and with the same compatible hole pattern, so one can build everything from the same set of elements, and can reuse the parts from a no longer needed object to build something else. Or reconfigure the furniture according to current demands, using an inbus wrench. Compatible with ISO pallets. Size is 700 x 350 x 350 mm, together with with handles and corner elements etc. up to 800 x 400 x 400 mm is allowed. Same size walls. The basic wall size is 350 x 350 mm, and in this case I build double-depth boxes, so some walls are 700 x 350 mm. 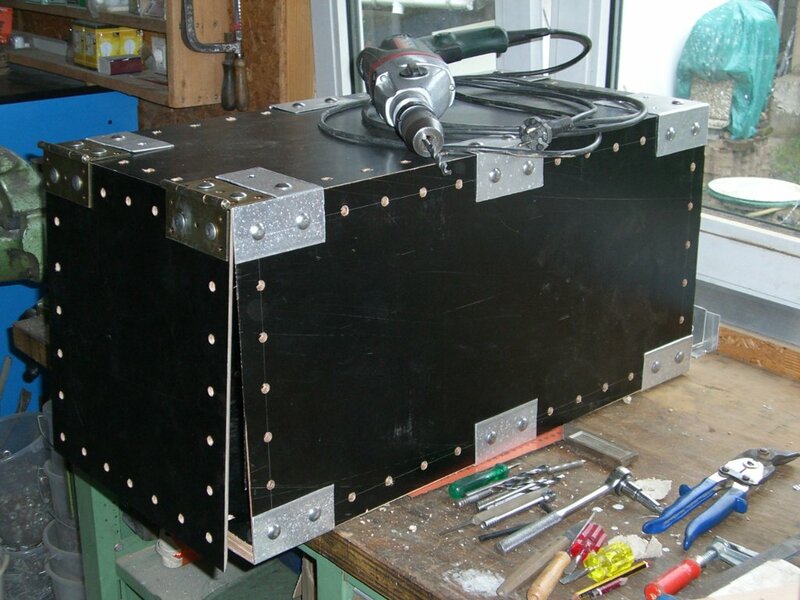 These larger walls could also be created by combining two of the smaller walls with aluminum sheet metal connectors; and likewise for even larger boxes. 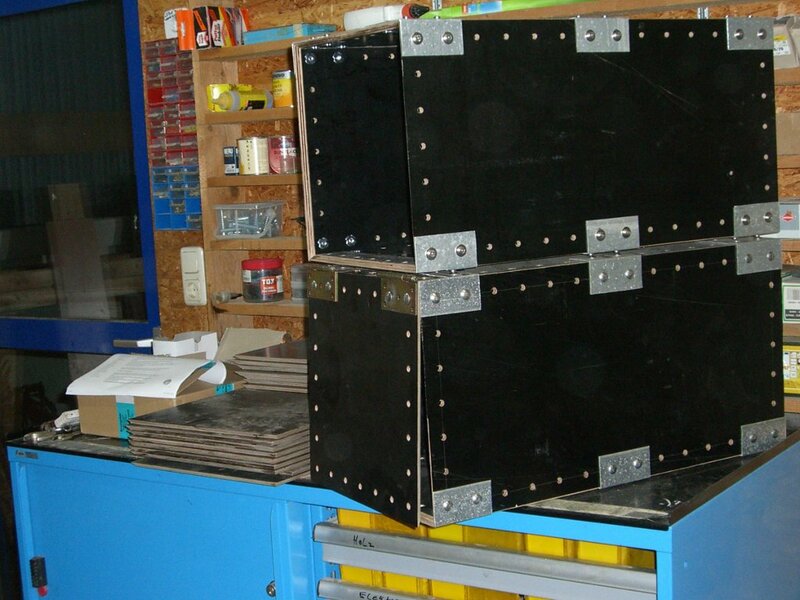 To allow creating a box from just same-sized walls, the walls have 45° beveled edges. 50 mm gridbeam system. 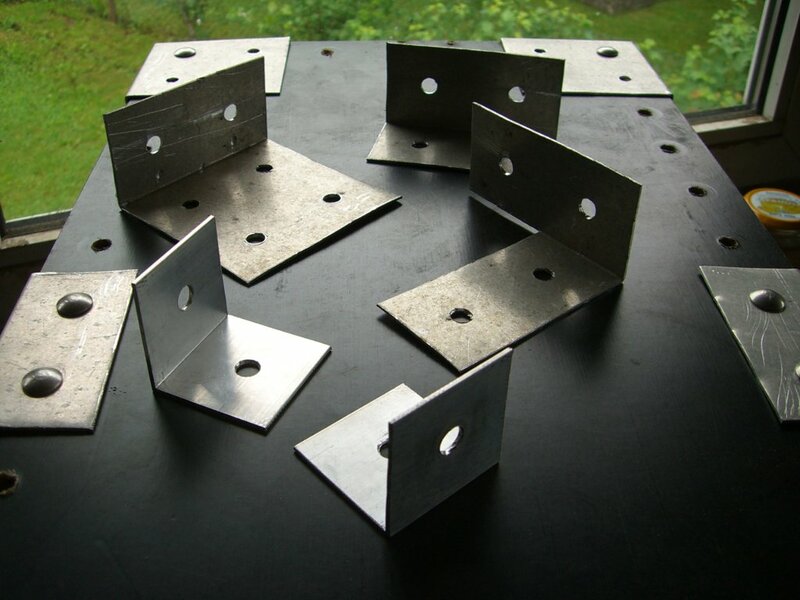 This means, all sheet material has a 50 x 50 mm hole pattern starting 25 mm from all edges (holes are here only around the edges, more holes can be added on demand). 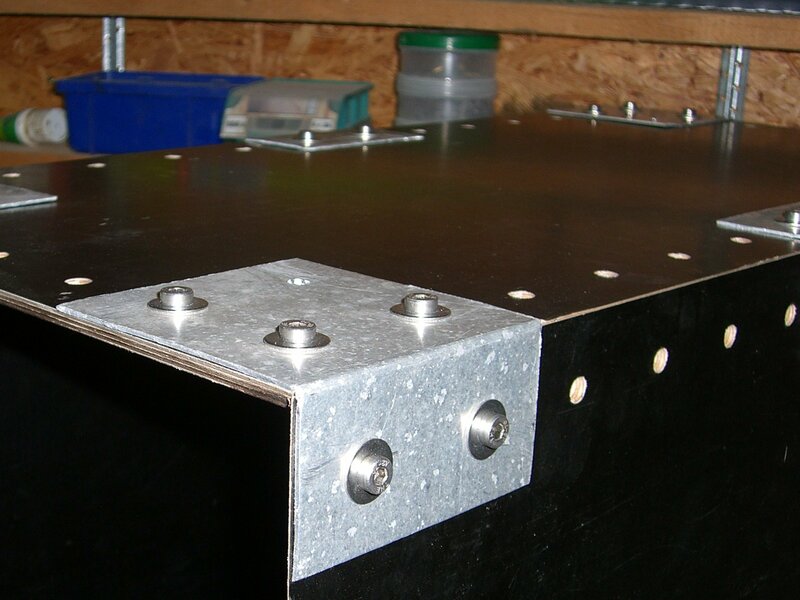 Holes in boards are 8.5 mm for M8 bolts, but in the case of boxes fitting for M6 sleeve nuts. Holes in aluminum connector elements are 6.5 mm for M6 bolts. Modified hammer-in nuts. I really had a problem finding reasonably priced sleeve nuts for going into the board holes – I'm just not paying 1 EUR and more for one lathed sleeve nut, that would be 55 EUR per box for 'em alone. So I finally tried ordinary M6x8 hammer-in nuts with their four spikes, and just cut away the spikes with tinsnips. By letting 1 mm of the spikes in place, these nuts will not even free-rotate when at the loose end and turning a bolt into them. They have enough grip in wood that way, while the sheet wood and the nut is still reusable infinitely (which was not the case with the spikes in place). Bolts used. Currently M6 x 13 stainless steel (A2-70) bolts with inbus head. Used together with a washer to secure the bolt against loosing and to better distribute the force to the (relatively soft) aluminium sheet metal. Apt for cheap and salvage materials. I'm currently creating the corner elements from simple aluminum sheet metal that I had lying around and that can be had from the local recycling yard nearly for free (as in free beer, not as in FREE BEER). Using 50 x 50 mm and 100 x 50 mm aluminum L-profile is also possible and looks better (examples in second picture) but is of course more expensive and less autarkic. Also, one can use many different types of material for the box walls: any thickness will fit because of the beveled edges and because the box's outer measures are standardized, not the inner ones. 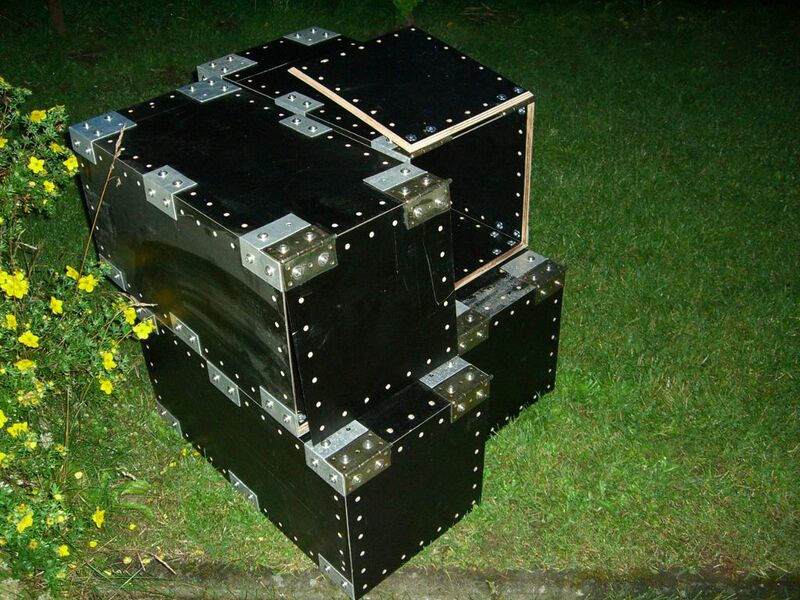 Nearly finished 1st version gridbeam box. Various sheet metal parts for the boxes, 50 mm gridbeam pattern. 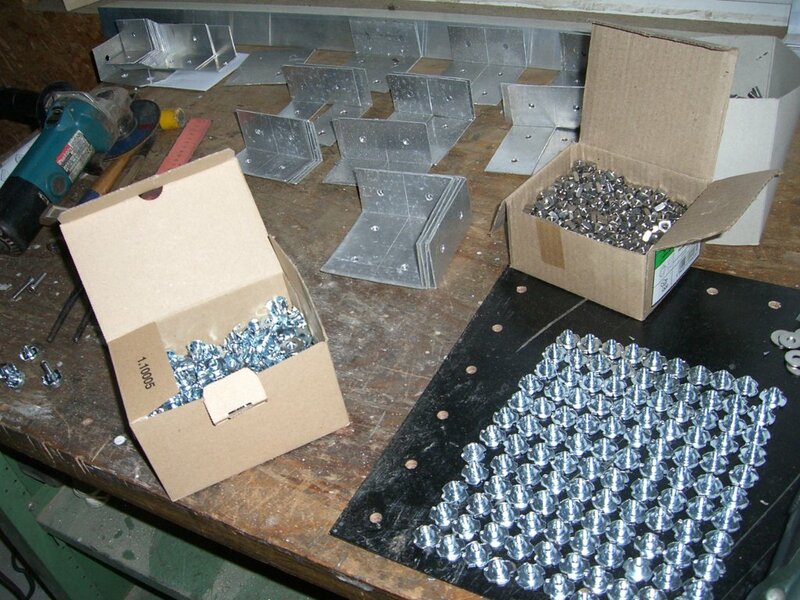 Box parts: modified hammer-in nuts, aluminum parts. 1st version box below, 2nd version on top. 2nd version box, yet without flap. 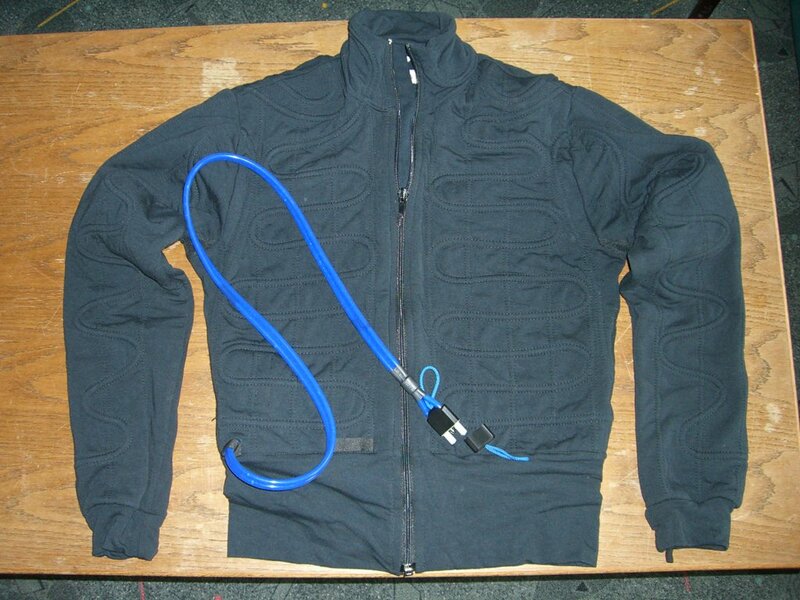 Unrelated but funny: fluid-heated jacket. See this unrelated item in the media gallery? It's a rare Thermoflash fluid-heated jacket that I got as a bargain on eBay. Can keep everybody warm through German winter. Yep, really everybody 😉 Normally used on motorbikes and connected to the engine's cooling circuit via a heat exchanger and digital temperature control. Posted in [All], [English], #vanlife, EarthOS. Why did you choose a 50mm grid? The original Gridbeam is 1.5 inch, Lego grid (and several compatible systems, such as Makebox) is 8mm, OpenStructures is 40mm (or 10mm). We should better 50mm looks like an incompatible choice compared to these systems. Would you use another grid value when starting over again? Hmm. I think I tried a 40 mm pattern before, and it all did not really fit together for furniture-size wood constructions with standard nuts and washers and mitered sheet material. Which was the only construction method I found for having all walls and connectors compatible with the system's standard measures. (Trying this with 40 mm, what did not fit is having too little material from hole until the edge of sheets, and too little space for the nuts inside. Also, 40 mm wood beams are not strong enough for bigger shelves etc..) A secondary reason was that halving and duplicating from a 100 mm base gives "nice numbers" from 800 mm down to 12.5 mm. However, I was not aware of the OpenStructures project. Nice one, thanks for the tip! I might have forced my stuff to their system else ("measurements […] should correspond to either 0,125cm / 0,25cm / 0,5cm / 1cm / 2cm and multiples of 2cm"). What's elegant in their system is allowing multiples of 2 cm (though duplication seems preferred, as per their examples: 4 cm, 8 cm, 16 cm …). So starting from 2 cm, they have a unit of 2 cm, which is way more flexible than a unit of 5 cm as in my case. I’m planning to adapt the gridbeam system to the metric systemas well, and decided that 50mm would be a good choice for a base metric. I’m going for hardwood beams (from beechwood) and wasn’t too sure whether to use M6 or M8 bolts. Following your example, I’ll use M6. Thanks for your inspiration! Hi goocy, glad the article was useful. As a comment from now some years of using these boxes as furniture in my truck home: (1) the mitered edge design is not useful, as it results in 45° edges, sharp enough to hurt oneself when not careful, (2) this removes my design reason for the 50 mm grid, so now I would definitely go for a 40 mm grid (compatible with OpenStructure’s “multiples of 20 mm”, which is more flexible for building stuff than my “multiples of 50 mm”), (3) M6 bolts (stainless steel in A2-70 strength) are way enough for furniture use, never had a problem here, (4) I still like the system with hammer-in nuts but next time would only go for stainless steel ones (which are hard to find, but zinc coated ones are just corroding too easily, esp. 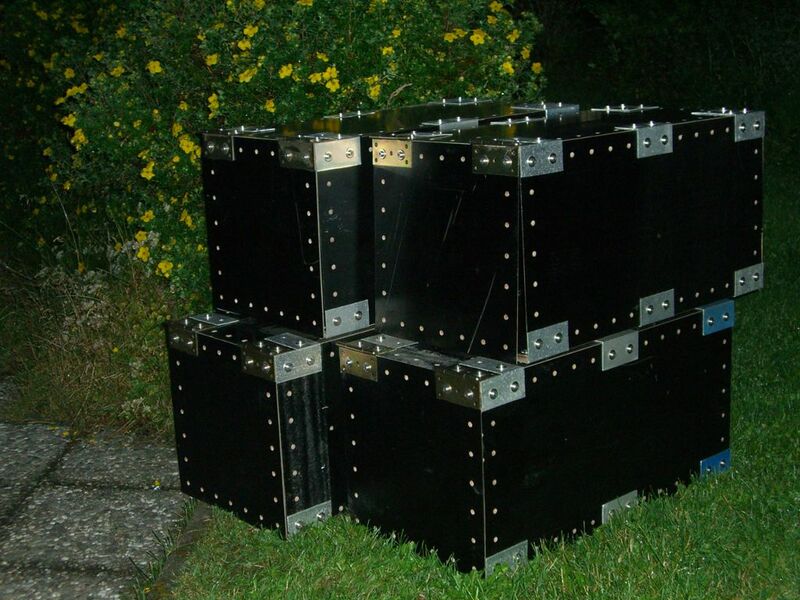 when combined with other metals and the tips snipped off), (5) I would now choose the measures of my boxes (and all my other furniure) to be 400 x 600 mm (and and height), compatible in size with Euro pallets and thus also with a lot of commercially available boxes from aluminium and plastic.